Today, Urban Meyer, once again tells Gators Nation it’s over. Hey we don’t blame you good sir. In the last two years you’ve lost Dan Mullen, Charlie Strong, Cam Newton, and Tim Tebow. Meyer wouldn’t have lost Newton if Tebow had not come back for his Senior year. Newton wanted to get on the field and he withdrew from Florida and attended a Junior College where he would take them to a Championship game. One year later, Cam Newton, is taking the Auburn Tigers to the BCS National Championship Game with a 13-0 record. Perhaps the best and most versatile player in college football now. Newton, that boy can run and throw. You want to know who the next Michael Vick is you don’t have to look much further. Cam Newton is most likely to walk away with the Heisman trophy this weekend. Urban Meyer, is walking away from the stress of a disappointing season and building a dynasty to spend time with his family. It’s one thing to say it and then one month later accept a head coaching job with the Denver Broncos. (Calm down it’s a joke.) I’m not saying that specific event will happen, but it is possible Meyer could take a job elsewhere. However, I am not saying that he will. I think Meyer is done at least for the next couple of years. 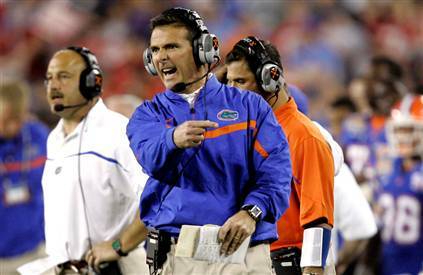 Urban Meyer gave the Gators Nation six solid years as a head coach for the University of Florida. I never agreed with the spread offense that he and other coaches run, but when you have kids like the Tim Tebows and the Cam Newtons it works. The Gators didn’t have any of those weapons this year and Meyer kept trying to run this gimmicky offense. It didn’t work this year and it’s obvious why. Gators Nation, you guys shouldn’t be so shocked about this news. Meyer almost hung ’em up last year, but gave it one more shot. There is no reason to freak out and act like you didn’t know this was going to happen. Next year begins a whole new chapter of Florida Gators football. The big questions now are who becomes the next coach and what’s going to happen at the quarterback position? What will the next football coach do with John Brantley, Trey Burton, and Jeff Reed? Urban Meyer will coach the bowl game for the Gators and then leave the controls to his predecessor. This entry was posted in Sports and tagged Auburn, BCS, Broncos, Cam Newton, College, Denver, Florida, Gators, Gators Nation, Heisman, National Championship, NCAA, Tim Tebow, UF, Urban Meyer. Bookmark the permalink.